They don't spread diseases as frequently as other pocket pets like rats and mice, but unfortunately there are some illnesses guinea pigs can pass to their human companions. Most of these diseases aren't serious in healthy adults, and the risk of contracting them is low, but a little prevention can minimize the risk. Often called LCMV, the lymphocytic choriomeningitis virus is usually spread to humans by wild rodents like mice and rats, but can sometimes come from pet guinea pigs. According to the Centers for Disease Control, it is rare for a person to contract LCMV from a pet. In cases where it does happen, the guinea pig or other small pet has usually been exposed to an infected wild rodent. Some people will have no symptoms from LCMV while others will have flu-like signs such as fever, muscle aches, vomiting, stiff neck and loss of appetite. Like LCMV, leptospirosis is normally spread to humans by undomesticated rodents, especially rats. 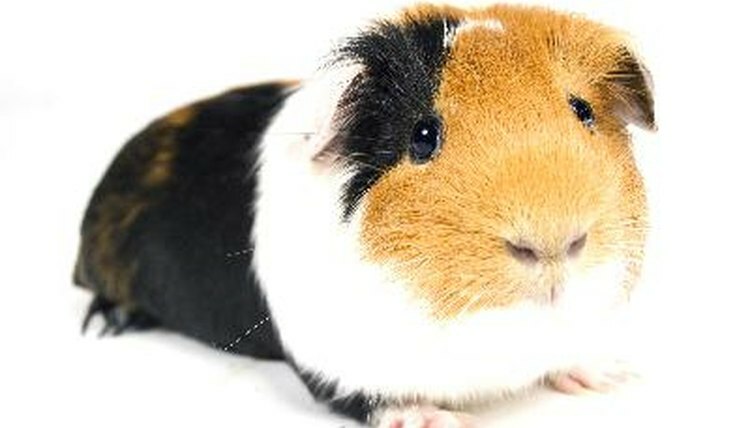 Guinea pigs can carry and spread the bacteria, however, especially if they are kept in conditions where they come in contact with infected rats. Most healthy adults and children have only mild symptoms and recover quickly from leptospirosis. Chills, headache and muscle aches are the most common symptoms. Some people can become critically ill and even die from leptospirosis if the bacteria infects their organs. Severe cases are usually found in young children and the elderly. Rodents and reptiles are known for spreading salmonella to humans. Guinea pigs can pass the bacteria to people through their feces. Salmonella is usually not serious but can cause diarrhea, stomach cramps and fever. Guinea pigs can carry salmonella while still appearing to be perfectly healthy. Keeping yourself, your guinea pig and his enclosure clean is the best thing you can do to stay healthy. Wash your hands after handling your furry friend and don't let him come in contact with your lips or mouth. Clean his cage frequently and wash your hands and arms thoroughly when you're done. If you have cuts or scratches on your hands or arms, wear rubber gloves or have someone else do the cleaning. Also, keep your guinea pig away from any place where human food is prepared or eaten. Do Little Field Mice Bite?